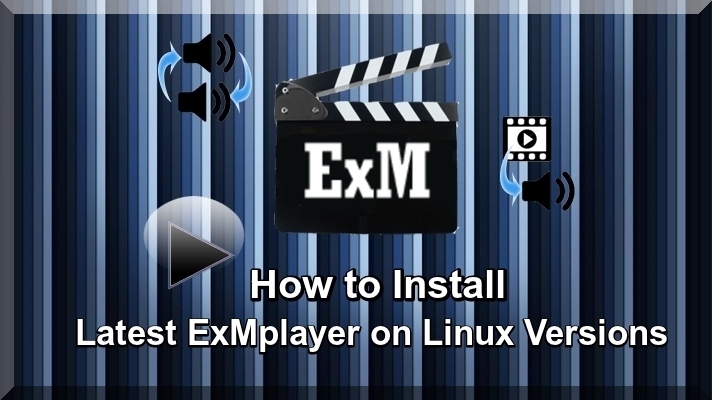 By this useful Article I guide you that how to Install ExMplayer 5.0 or later on Latest Linux versions, such as Linux Mint, Ubuntu and others. ExMplayer 5.0 is latest and very popular Video Player it is called extended MPlayer. It has built in 203 Audio Codecs and 321 Video Codecs and it plays most video formats. It support network streaming and other audio, video formats such as DVD ".vob" , VCD ".mpg, .dat" and others. You can read more tutorials about more useful Video Players for Linux. There is also support for subtitles library used to decode subtitles etc. In my experience it support 3D Movies, formats supported, like Side-by-Side, Side-by-Side Half size, Above-Below, Above-Below Half size. Put 3D Analgyph Glasses and play 3D Movies on your normal LCD and Monitor. If you have not 3D Glasses convert movie in 2D format and enjoy it. Anther great facility I watch it that you can boost volume up to 5000%, which means if a video has low volume then this player can boost volume with great performance. Now I guide you step by step that that how to install latest ExMPlayer in Linux Distros. You can also install latest VLC Media Player, MPV Player. Now install Latest ExMPlayer to use following command in terminal. In view of above, this tutorial is very useful like other Linux tutorials, you can download and install more Linux Video Players.